Are you a carbon fiber buff? Then you have to check out these carbon fiber seat backs for your M2 Competition. Each order of the M2 Comp carbon fiber seat backs includes 2 seat backs which install onto your existing seats with 3M tape. These seat backs are crafted from genuine dry carbon fiber for a seamless fit and finish which looks like it came this way from the factory. Each M2 Competition carbon fiber seat backs set has 2x2 CF weave and will nicely match the interior carbon fiber trim you have on the vehicle. 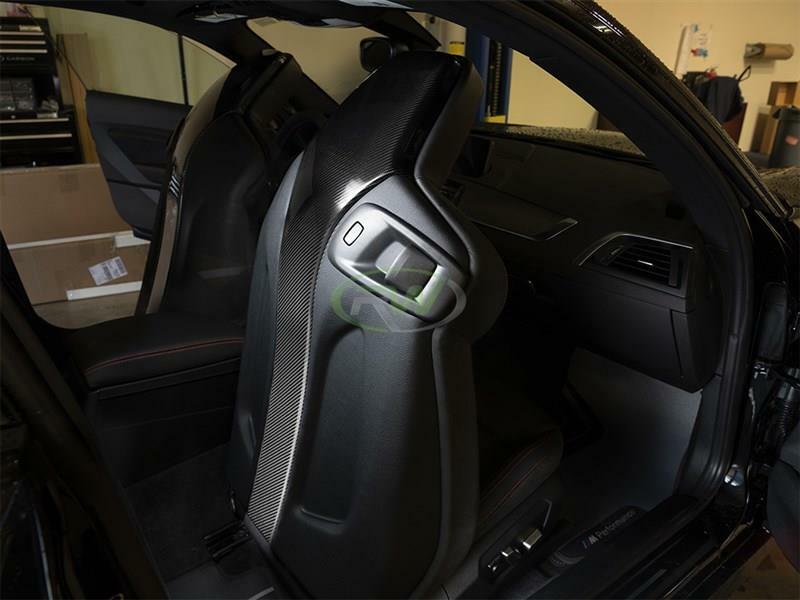 These BMW F87 M2 Competition seat backs mount to your OEM seat using 3M double sided tape. We know there are many companies out there claiming to have the best M2 carbon fiber upgrades. At RW Carbon we take the time to quality control every single set of carbon fiber seat backs that ship from our warehouse. When you order from many companies online they are shipping a product straight from overseas that has not been quality controlled. If you order one of these parts you could receive a set that is damaged, has scratches in the clearcoat, or overall poor carbon fiber construction. By choosing RW Carbon we make the promise to deliver you a consistent, quality product that is shipped from our Southern California location. Additionally, all products shipping from our warehouse are meticulously inspected, and packaged to ensure you receive the best possible carbon fiber item for your BMW. Don't take the chance of getting a carbon product that barely fits - Get one that fits great and looks amazing on your F8X from RW Carbon.